Quick 2 Sleep is a dietary supplement. 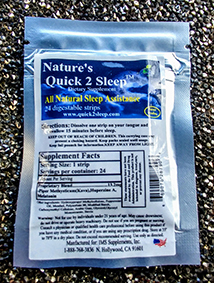 Quick 2 Sleep™ is a proprietary blend as stated on the Supplements Facts Table. Quick 2 Sleep™ unique route of administration a digestible oral strip presents an opportunity to use low dosages due to the fact that the product is administered within the mouth and not swallowed like a capsule or tablet that must make its way through the digestive tract. The mouth contains many small blood vessels called capillaries right below the surface of the skin. This allows for absorbtion of the ingredients into the body. The proprietary blend used in Quick 2 Sleep™ was originally discovered by Dr. Roger Bijlani, a master Acupuncturist and Herbalist, who has spent years developing Supplements for some of the biggest names in the business. Since Quick 2 Sleep™ is a proprietary blend the amount of each ingredient is protected in the formula. The total weight of all ingredients in the Quick 2 Sleep™ formula is 13.2 mg. In addition to a small amount of melatonin Quick 2 Sleep™ contains Piper Methysticum (Kava) and Huperzine A, two all-natural ingredients in the correct ratio to induce restful sleep quickly. Piper Methysticum (Kava root) has been used for centuries in the the Pacific Ocean cultures of Polynesia. It is known to reduce anxiety and stress and has a sedating effect. Used appropriately and in extremely low dosages less than 13.2mg daily reduces and eliminates the risks commonly associated and seen at high dosages. Typically Piper Methysticum (Kava root) is sold for use in dosages between 100mg to 300mg per day. No recommended dosage for supplements that contain Piper methysticum has been determined. According to the Natural Medicines Database, kava root extract is commonly taken at a dose of between 100 – 300 mg per day. However, different products may contain different concentrations of active kavalactones. It is important to follow dosage guidelines provided by the manufacturer of the specific product you are using. Quick 2 Sleep™ also contains Huperzine A derived from club moss that is known as a cognitive enhancer because it acts as an enzyme inhibitor. The enzyme it inhibits is responsible for a decline in cognitive function. The ingredient has been investigated for its benefit in Alzheimer's disease. At this time the ingredient is thought to improve memory and concentration. The unique ingredient combination found in Nature’s Quick 2 Sleep™ works synergistically so that even people who have not slept well in decades reported the ability to get to sleep and wake rested and refreshed in the morning. If you have tried melatonin, and it hasn't worked for you, or you want something that works quickly, you owe it to yourself to try Nature’s Quick 2 Sleep™ sleep aid Strips.